It’s a normal practice to have artists and celebrities in general show off and brag about what they have. 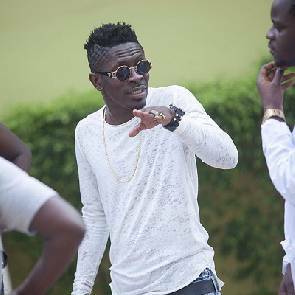 Though some Ghanaian artists do not feel the need to do that, 2014 VGMA Best Dancehall Artiste of the year, Shatta Wale, thinks otherwise. From how much he gets paid for a performance to how much he earns for an endorsement deal to how much he purchases his properties; the ‘Kakai’ hitmaker has never been coy on flaunting his assets, achievements or records – and he has never given a hoot about what anybody thinks. In an interview with Sammy Flex on Pluzz 89.9, monitored by Entertainment Ghana; he was, again, on a self-aggrandizing agenda, as he disclosed how he sits on top as the artist of his age to have the most affluence in Ghana. According to him, he’s made the most money and presently has more money than any artist his age in Ghana. “I have more money than any artiste of my age in Ghana,” he said. However, in all the gloating, he was short of giving an estimation of how much he’s worth, to back his claim of being the richest of his era. Aside the music, Shatta Wale is renowned for his consistent showcase of his cars, houses and money to the general public via his social media platforms.